Today I got to meet a lot of folks at EdCamp Mid-Michigan in Charlotte, MI. Some of them are seasoned tweeters and bloggers (Elizabeth Wellfare – @ealfoster or Tara Becker-Utess @t_becker10, for example) and some are just starting out. A couple of people got set up with their very first Twitter handles today. Welcome. I talked to a couple folks who are interested in starting their own blogs (or rethinking the way they use the blog they already have). Now, that EdCamp is over, we start the “now what?” stage of all the new stuff we learned. How intensely do we want to attack it? How is it going to be useful to us in the practice of constantly improving as educators? All of these are fantastic questions. We discussed some of these issues already, but I want to offer a bit of encouragement and advice. First, don’t be afraid to be selfish. (I believe Dan Meyer – @ddmeyer gave this same advice a few weeks back). By that, I mean that you are likely going to take a WHOLE LOT more than you give for a while as you start out in the world of twitter and blogging. That’s okay. The first major idea is trying to decide what you want the Twitter feed or the blog to do for you and your professional practice. Sometimes the first step in that is seeing what other people are doing. How do they tweet? What do they tweet about? How do they use #hashtags? What do they blog about? What types of blogs/tweets are interesting for you to read? Tweet and blog about the stuff you find interesting. Your blog and your tweets should AT LEAST be interesting to you. Second, keep at it. When you first start tweeting/blogging, chances are that you (and a very few other people) are going to be the only ones reading. That’s okay. That changes over time. The more you write/tweet/interact/question/comment/favorite the more you will find people who are trying to do the same things you are doing. And THAT is what you want. You want to begin to form a network of people who are all trying to support each other in common goals. Now, if you are brand new to this, follow me at @hs_math_phys. When you start your blog, tweet me the link to your blog. I look forward to reading your ideas and thoughts. Finally, if you want a nice network of people who want to read your thoughts, check out The MathTwitterBlogoSphere homepage for a ton of GREAT bloggers and tweeters. Don’t let the name fool you, it’s not just for math teachers. There are takeaways for educators of all makes and models. They are good people. Welcome to our world. Please don’t be a stranger. And Please, let me know what I can do to be helpful. A New York Times article by Elizabeth Green has made its social media rounds lately. “Why Do Americans Stink At Math?” has been tweeted/shared a couple million times by now, with good reason. The “traditional way” that Ms. Green speaks of is summed up a bit later in the piece. Most American math classes follow the same pattern, a ritualistic series of steps so ingrained that one researcher termed it a cultural script. Some teachers call the pattern “I, We, You.” After checking homework, teachers announce the day’s topic, demonstrating a new procedure: “Today, I’m going to show you how to divide a three-digit number by a two-digit number” (I). Then they lead the class in trying out a sample problem: “Let’s try out the steps for 242 ÷ 16” (We). Finally they let students work through similar problems on their own, usually by silently making their way through a work sheet: “Keep your eyes on your own paper!” (You). Sometimes trainers offered patently bad information — failing to clarify, for example, that even though teachers were to elicit wrong answers from students, they still needed, eventually, to get to correct ones. Textbooks, too, barely changed, despite publishers’ claims to the contrary. So, here we go. Sounds like a big problem, right? I’m not that concerned. Ya know why? First off, I don’t want to give the impression that I think that Green is writing untruths or is exaggerating. That isn’t where I’m taking this. American math education needs some serious work. But see, that’s where I get encouraged. Let’s look at a specific bit of content. How about volume and surface area of prisms? These practice problems fit in with the “I, We, You” model that Ms. Green described in her article. Right on cue, the textbook appears to be pitching to our education system’s weaknesses. But those weaknesses have entered a brave new world where teachers who have found models that work are not only willing, but also able to share them freely for anyone and everyone who might be looking. Andrew Stadel’s “Filing Cabinent” is, by content standards, just another prism surface area problem. But, the situation he sets up is anything but ordinary. Timon Piccini’s “Pop Box Design” asks a relatively simple question in a context that is approachable by practically everyone. All those fantastic resources are available… for free. And the creators can be reached if you have a question about them. A movement has begun. An (ever-growing) group of math teachers decided that it was one thing to discuss reforming math education and it was quite another to effectively reform math education. The group is getting larger. It’s inclusive. It’s welcoming. It’s free to join. And it doesn’t expect anything from those who join. Everyone does what they are able. Some share lots. Some steal lots. Some do both. The bank of resources is growing. And this isn’t legislated reform. There is a genuine desire for this. I spoke in Grand Rapids, MI this past spring and was amazed that the crowd that was willing to gather to hear someone talk about reforming math education. Nearly 100 folks crammed into a room to have, what ended up being a rather lively, discussion about how to engage all learners, push all learners, and keep as many learners as possible interested in meaningful mathematical tasks. 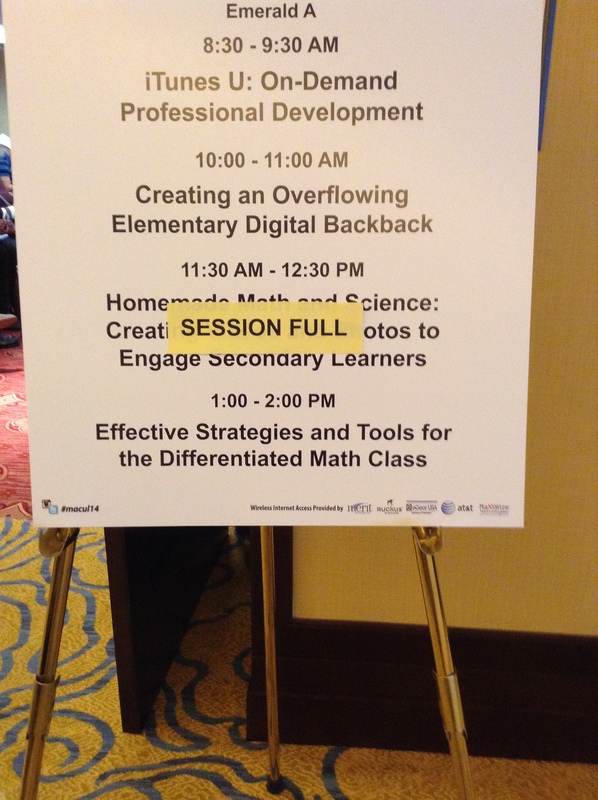 They had to turn people away from a talk on effective math lesson planning. So, Ms. Green is certainly right. Americans stink at math. But there is a growing group of teachers who are aware of the problem, interested in seeing it solved, and now, more than ever, there are places they can turn to, people they can reach out to (and who are reaching out to them). And it is all available for free on technology that practically everyone already has. So, forgive me, but I am quite optimistic about where this might take us. I think I want to try student blogging next year in my Algebra II classes. I’ve only ever taught Algebra II once and I didn’t do a particularly wonderful job. It was the sense-making that really got to me. My students were pretty good at learn procedures and algorithms, but the long-term retention was remarkably low. I have seen several examples of student blogging and feel like if I framed the discussion questions properly and encouraged the students to read each other’s posts, and comment. That could… COULD… open up a different mathematical thinking experience for the students. If that were used to supplement the number-crunching practice, and the group problem-solving and exploration, that could potentially act as a way to deepen (or at least broaden) the thinking that the students were being asked to do. In addition, the opportunity for the entire internet to read and respond can add an extra-level of interaction. The students wouldn’t have to apply their real name if they didn’t want to. There is a chance for creative anonymity. All of that being said, if you have your students blog, will you please comment on this so that I can pick your brain on what’s worked, what hasn’t, what to watch out for and what to definitely do! Links to other blog post would be much appreciated. E-mail this post to people you know who do this. I would love a rich, challenging comment section on this one. And trust me, if you don’t help me, I will make my own idea and learn this the hard way!